Laser diodes are an ever-increasing part of everyday life. Indeed, when people go through the course of a single day of their lives, they will encounter perhaps hundreds or even thousands of laser diodes. Commonplace examples of the use of laser diodes include CD and DVD drives, barcode scanners, laser pointers, construction alignment devices, and police traffic radar. Most laser diodes can be easily damaged if their nominal voltage or current parameters are exceeded. In fact, products that contain laser diodes often seem to mysteriously fail, with no apparent provocation. A close examination into the failure modes of these devices has revealed power surges during power-up/power-down sequences and electrostatic discharge (ESD) events as two major causes of laser diode failure. When power is being turned on or off on a product, internal circuits can be operating outside their intended internal power supply range for a brief period of time. As one example, rail-to-rail operational amplifiers used in laser diode drivers may be specified to operate with power supplies ranging from 2.7 to 5.5 volts. But the manufacturer makes no guarantee or representation regarding what the operational amplifier will do between a supply voltage of 0 and 2.7 volts. Because of this, current or voltage regulation circuits may go out of balance during power-up and power-down, and often apply an over-current or over-voltage condition to the laser diode that is integrated within the product. These over-current or over-voltage conditions may stress the laser diode, such that each power-up or power-down cycle accumulates in the form of device fatigue. 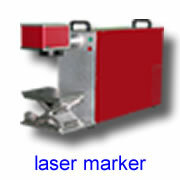 Eventually, the laser diode may fail from the fatigue, leading to what the user experiences as a mysterious failure. Electrostatic discharge (ESD) may also cause mysterious device failures, and there are many ways in which ESD might come in contact with a product. One of the most common ways that ESD is generated occurs when a person walks across a carpeted floor, and then touches something. A discharge can occur to anything being touched, ranging from things that are not sensitive to ESD, such as doorknobs, to things that are very sensitive to ESD, such as electronic products. Studies have shown that, when an ESD discharge occurs, the discharge voltage can range anywhere between 4,000 and up to as much as 32,000 volts DC, depending on environmental conditions, clothing being worn, type of flooring surface, and other factors. When an laser diode that is designed to operate with a terminal voltage of 2.2 volts experiences an ESD discharge of thousands of volts, the result can be immediately destructive. Alternatively (and what happens more commonly), the laser diode will have some latent damage, with dramatically reduced lifetime. Later, when it fails in the field, the user will often blame it on infant mortality or some other cause, not realizing that the actual damage began earlier in the product's lifetime. 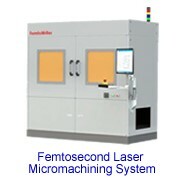 One of the damage mechanisms is optically related, and occurs when the laser diode is producing light (referred to as “lasing”), and the optical energy density exceeds the laser diode’s integral mirrors’ reflective capacity. When this occurs, the mirrored surface permanently loses its reflectivity, and the laser diode no longer functions properly. In layman's terms, this could be thought of as the laser light becoming so intense that it "vaporizes" the mirror surface. The second damage mechanism is related to failure of a laser diode’s P-N junction itself. A severe over-current or over-voltage power surge can cause localized heating and other harmful phenomena, which, under extreme conditions, can actually fracture the laser diode die (we have seen this under a microscope, brought on by high levels of ESD). 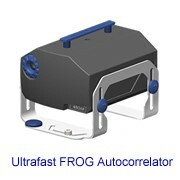 Both of these damage mechanisms can be provoked by an over-voltage or over-current condition. Low-power laser diodes, that is, laser diodes whose optical output power is below around 200 mW, are particularly sensitive to ESD. This is because they are designed to be inherently fast devices. Indeed, low-power laser diodes are often directly modulated and used for fiber-optic communication with data rates in the gigahertz range. Thus the P-N junction and optical elements of a laser diode can react very quickly to changes in voltage or current. Therefore, in order to be effective, an ESD protection device and method should preferably be implemented as a proactive measure, by preventing the over-voltage or over-current condition from happening in the first place, not by reacting to it once it has occurred. The figure to the right shows the current vs. voltage profile of a typical low-power laser diode. It can be seen that the profile is similar to other types of diodes and semiconductor devices. Starting from zero volts, applying incremental positive increases in voltage (i.e., those voltages that would tend to forward bias the laser diode), very little current flows until around 1.8 volts is reached. Further incremental positive increases from around 1.8 volts causes current flow to increase at a roughly exponential rate. However, the laser diode does not emit laser light until the current exceeds a “lasing threshold,” which, for the laser diode referred to here, occurs at around 30 milliamps and at around 2.2 volts. With further incremental positive increases in voltage, current flow continues to increase, while the optical power emitted by the laser diode increases at a rate that is roughly proportional to current. Once the maximum design current for a particular laser diode is reached (which is around 35 milliamps and 2.4 volts for this laser diode), further increases in current will likely result in failure, caused by one or both of the damage mechanisms described above. Thus it is important to completely prevent voltage, and thus current, from increasing beyond the absolute maximum rating for a particular diode. In most cases, a low-power laser diode will be destroyed if the absolute maximum ratings are exceeded, even for a brief period of time. Note that the figure shows only the current vs. voltage profile for positive voltages, that is, voltages that would forward-bias the laser diode. 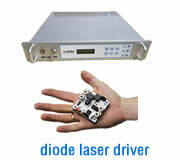 Laser diode manufacturers recommend that negative voltages, that is, voltages that would tend to reverse-bias the laser diode, be avoided. The data sheet for an exemplary laser diode lists an absolute maximum reverse voltage of 2 volts. In order to protect this laser diode from being damaged by ESD, the protection means should limit positive voltages to around 2.4 volts and negative voltages to around 2.0 volts or less. These voltages are used as a reference throughout the rest of this discussion. To solve the ESD problem, in 2008 we developed an electrical component called LASORB. 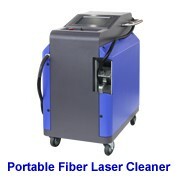 The word LASORB is a combination of the words “LASER” and “ESD ABSORBER”. The LASORB component is easy for engineers to implement because it is small and can simply be connected directly to the pins of the laser diode. LASORB's primary means of protection is a slew-rate detector that monitors the voltage across the pins of the laser diode. If there is a fast change-of-voltage condition detected, this triggers LASORB to aggressively conduct the voltage (and thus current) away from the laser diode. The conduction is initiated very rapidly – in some cases less than one nanosecond. The conduction can last from several microseconds, to tens of microseconds. There are several standard LASORB formulations -- optimized for IR, Red, Blue and BLU-RAY laser diode use, as well as series-connected strings and QCLs. We can also provide custom LASORB formulations. LASORB has several degrees of freedom that we can tune to optimize the device to a particular laser diode operating voltage and modulation requirement. Please contact us for the detailed data sheets.